As time goes by and with the successful completion of more and more Green and Sustainable projects, we at The Lime Plaster Company continue to notice the increasing number of familiar old materials being used in our construction industry. One of these materials is a product called Durisol. 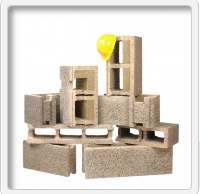 Durisol blocks are a pre-cast Cement/Wood chip block which contain only natural ingredients. They are composed of specially graded recycled waste wood which is chipped into wood fiber which is then mineralized and bonded with cement. It is then formed into a variety of shapes that comprise Durisol's range of reinforced forms for your next green building project. With a track record of over 70 years and a history of use all over the world and in a variety of climates we are excited to work with this material. With proper installation, both Lime and Clay Plasters are the perfect finish for Durisol blocks which offer a completely natural and unique alternative to drywall and paint. Lime stucco is a great material to use over the Durisol blocks and with our special blend and reinforcement process we find great results everytime. For further information on this unique building material visit Durisol's website or contact us!